Have you ever heard that a smile can be heard over the phone? We have, and we believe it to be true! And that’s why this week—Customer Service Week (which falls on the first week of October this year)—is a big deal for us. 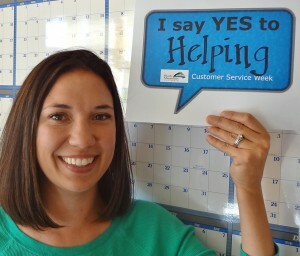 Not only is Customer Service Week the time of year to celebrate the progress we’ve made providing quality, in-house customer service, but it’s also a time for us to reflect upon the service we provide and determine how we can improve our customer engagements. While we realize that good customer service should describe every business/customer interaction, because so much of our support comes after the installation of our products and over the phone, we thought we’d focus on one key aspect of customer service: phone etiquette. Here are some key things any organization can look at when evaluating their phone interactions to improve their level of customer service. Greeting customers on the phone is so much more than just saying “hello.” Your greeting should be clear, audible, warm and professional. Typically, announcing yourself using your name, company and department name is deemed good etiquette. But bonus points go to employees who also ask how they can help right off the bat. Once the customer is on the phone, engaging them effectively will help ensure a good customer experience. This means actively listening so the customer does not have to repeat the problem, and responding immediately to show you are listening. Speaking with empathy and concern, and keeping the goal in mind to help them solve their problem should all be executed to the full extent of your ability when interacting with a customer. In the event that you are unable to solve the customer’s problem, it is important to make the transfer to another party swift and polite. Apologize for having to transfer them, try to transfer them quickly, and be sure to transfer them to a party that can actually resolve their issue. Long holds and multiple transfers are guaranteed to annoy your customer, so telling them the estimated wait time can be helpful. In addition, stay on the line with the customer until the transfer is complete (using a conference call feature if available), and be sure to announce the customer with their name and concern, followed by a thank you for holding. Good customer service means always putting the customer’s needs first. If you are unable to solve your customer’s problem in a timely manner on the phone, or if the problem requires follow-up, ask the customer when a good time would be to schedule a callback. Being empathetic to a customer’s busy schedule and accommodating it makes for good phone etiquette. Once you have done all you can to help the customer and (if necessary) scheduled a callback, be sure to end the conversation by reiterating what was discussed, then asking if there’s anything else you can help the customer with. Finish by expressing your gratitude for their business and wishing them a good day. Your interaction with a customer over the phone puts a voice to your company. You want that voice to be warm, welcoming, helpful, efficient, and solution-oriented. Good phone etiquette is key to providing a solid business/customer experience and a great thing to brush up on this Customer Service Week. This entry was posted in Best Practices, BMS Events, BMS Staff, Uncategorized. Bookmark the permalink. Follow any comments here with the RSS feed for this post. Post a comment or leave a trackback: Trackback URL.